If you decide on going to Morocco then it’s a good idea to learn some French. It’s the second language of the country and goes back to when France invaded back in 1912. Morocco got its independence back in 1956. From Rabat north to Fez is green and when I was there many of the wheat crops had been harvested. There were acres and acres of it but my host told me that is it not high yielding most years because of lack of rain. Did make for great photos though. I stayed in Sale. The capital of Morocco is Rabat and is separated from Sale by a river. There is huge changes happening in Rabat with a tram system being put through the centre of the city going all the way into Sale and there is construction of apartment blocks going from the sea all the way into a new mariner. This will certainly be something to see when completed. In Rabat there are the ancient ruins of Chellah, Le Tour Hassan with the remains of an ancient mosque, and the Mausoleum of Mohammed V.
The Palace in Rabat has an impressive wall surrounding it and you cannot enter. 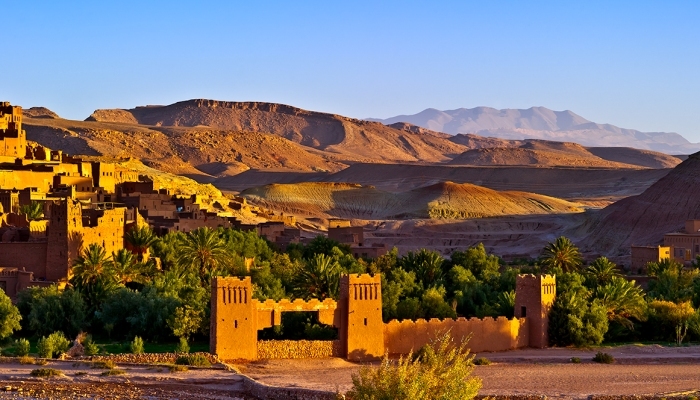 The king has five palaces in Morocco. The walled Medina is great. Stroll through here and have a coffee. You can shop for carpets, crafts, DVDs or shoes. Wander down along the river and sit watching the boats ferry people across the river just as they did hundreds of years ago. There are cafes all along here so join the relaxed atmosphere of Rabat and do what the locals do. Taking of coffee, as my Moroccan friend calls it, can take an hour. There are taxis everywhere and the smaller ones are used when there is only 2-3 people and the bigger ones for 3-5 people. There are museums and galleries to visit and Rabat has one McDonalds that I saw. I found that Moroccan food has good taste, in fact I thought it tasted as good as NZ. There is plenty variety of fruit and vegetables, and so many shops that sell cakes and sweets. But I now hate almonds. It seemed to be on or in everything. Almond oil, almond shavings, almond flavour in this, in that, in everything. All in all Rabat is modern and enjoyable with good hotels and it attracts its fair share of tourists. 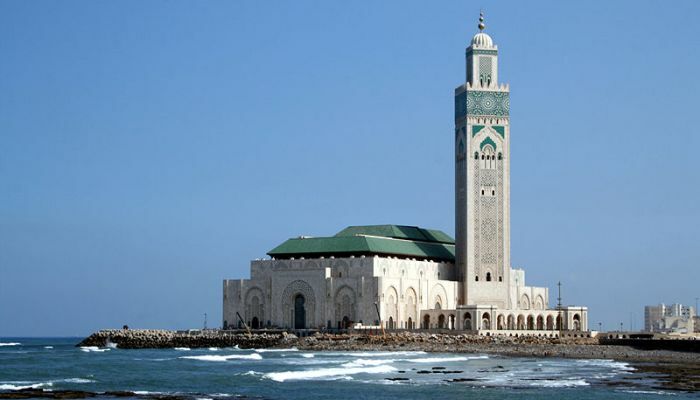 In Casablanca the one thing never to miss is the Hassan II Mosque. Built at a cost of US$1Billion it is huge. Built right on the sea and with the minaret towering to 210mts. Marble and mosaic tiles of greens and blues. It is the worlds 3rd largest mosque and the largest in Morocco. There are visitor’s tours every day which is not short of tourist from all over the world wanting to do. You are allowed to takes photos all through the tour no matter what area you are in. Many of my friends have marvelled at my photographs. This was a great few hours and so worth seeing. It has caused controversy in Morocco because of the cost but my friend I stayed with thinks it was worth the price. Many of the locals go there every day to worship. The worshipers can be viewed through a glass floor. Check out Lonely Planet’s website for all the statistics on this awesome structure. Casablanca itself is a little dirty but I think it seemed more so because of all the old crumbling buildings. There is alot of Art Deco influence in the city. The shops do have very fashionable clothing, shoes and hardware. The young girls and teenagers where certainly into fashion, in fact many young girls and boys smoke. Don’t forget to take a trip down to harbour. Head to Central Market for lots of fresh fruit and vegetables and grab yourself a deal as you hunt amongst the many stalls. Fez is very hot being inland and very busy. Tour buses trying to squeeze down narrow streets and people and donkeys. Get the money out and spend if you have some way of getting it home. Apart from the very favourable exchange rate there are the carpets to die for. I love them with there amazing designs and colours. Old Fez is the largest medieval Islamic city in the world and nothing looks like it has changed from when it was first created. This was until I went into a little museum in the heart of the medina and went out on the roof. It is a maze of satellite dishes and nearly everyone has the ‘cell phone’. It just seems so odd when down in the narrow streets there are the donkeys and mules hauling the produce from a to b. You can shop for everyone within walls of the medina as there is no lack of shoes, clothing, souvenirs, and the unusual to buy. The lighting shops are amazing. Set aside 3-4hrs as you will find yourself stopping every few steps. Have the address of where you are staying ready to fill in on your immigration form but also when you leave the country. You have to put the address of where you stayed when leaving which I didn’t have on me so just wrote out what I could remember of it. They do get annoyed if you don’t fill it in. Make a point of visiting Rabat. It is having a major makeover and I found it a very relaxing place to stay and with lots of interesting history and things to see. Try chous chous if you haven’t before. In fact try all the Moroccan food you can as it has great flavours. It would be best to go with someone who can speak French or if you are lucky enough to have friend living there then you can experience Morocco in an exceptional way. I did not come across many Moroccans that spoke English other than the guides at the mosque and some of the stall owners in the Fez Medina. Take the trains here as they aren’t too bad, better than Italy and faster and the easy way to get from city to city. Stay at a hotel if you have had enough of hostels. The prices are very good and the exchange rate helps. ATMs are easy to find but take cash if heading to very small towns and villages as they are few and far between out there.